To Mr. Parker, forty shillings. To the poor of Dedham, twenty pounds, to be a continued stock for the poor to the world's end, and it shall be ordered at the discretion of the Governors of the Free School of Dedham. 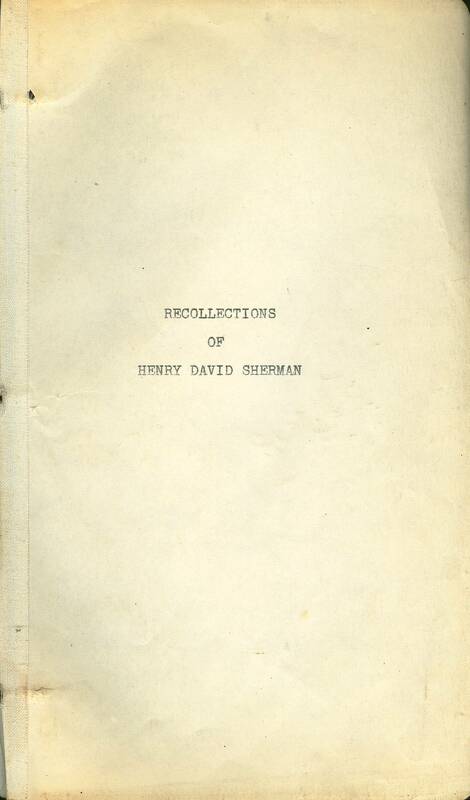 To Henry Shearman my son my shearman's craft to him and his heirs forever, and all the household (stuff) in his house. To son Henry's children, that is to say. Henry, Samuel, Daniel, John, Ezechiell, Phebe, Nathaniel and Anne Shearman, to each of them five pounds apiece, to the sons at two and twenty and the daughters at one and twenty. To son Edmonde Shearman, ten pounds. To Edmonde Shearman, the son of my son Edmonde, thirteen pounds, thirteen shillings and four pence at two and twenty, and if he die before then to be divided between Richard, Bezaliell and Anne Shearman, the children of my son Edmonde. To Richard, Bezaliell, Anne and Sarah Shearman, the children of my son Edmonde, forty shillings apiece; to sons at two and twenty and to the daughters at one and twenty. To my son-in-law Wm. 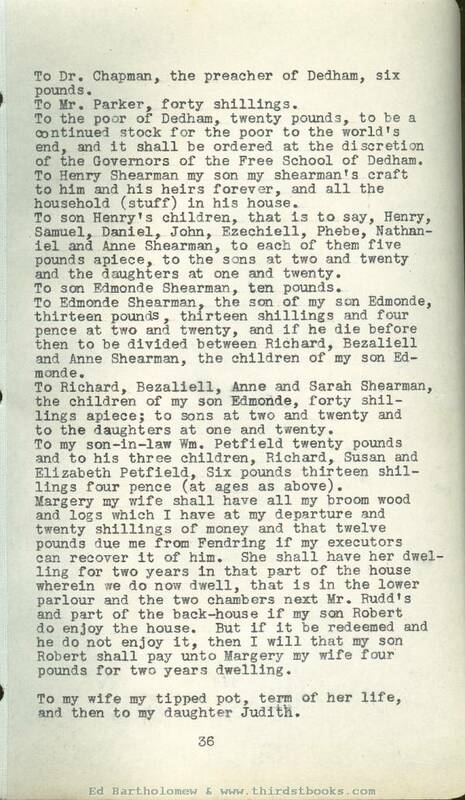 Petfield twenty pounds and to his three children, Richard, Susan and Elizabeth Petfield, Six pounds thirteen shillings four pence (at ages as above). Margery my wife shall have all my broom wood and logs which I have at my departure and twenty shillings of money and that twelve pounds due me from Fendring if my executors can recover it of him. She shall have her dwelling for two years in that part of the house wherein we do now dwell, that is in the lower parlour and the two chambers next Mr. Budd's and part of the backhouse if my son Robert do enjoy the house. But if it be redeemed and he do not enjoy it, then I will that my son Robert shall pay unto Margery my wife four pounds for two years dwelling. To my wife my tipped pot, term of her life, and then to my daughter Judith. To my son Robert three score pounds, the which I give for the state of the house wherein I now dwell, which was lately Richard King‘s, beer brewer, of Colchester. Other realestate to Robert. To Jane and Anne Shearman, daughters of Robert, five pounds apiece, at one and twenty. To Robert all of the household stuff which I had before I married Margery my wife. To him also my silver and gilt goblet, a sword and bill, etc. To my daughter Judith Petfield the chest and linen upon the "soller". To my son-in-law, Nicholas Pynce, forty shillings. To my son Henry Shearman twelve silver spoons. To Henry my son all my armour except that which I gave to my son Robert. Other bequests to children. To Christopher Stone a cloth doublet. To each of my sons, Edmonde, Henry and Robert, twenty shillings in gold, and to daughter Judith the same. Sons Henry and Edmonde to be executors. 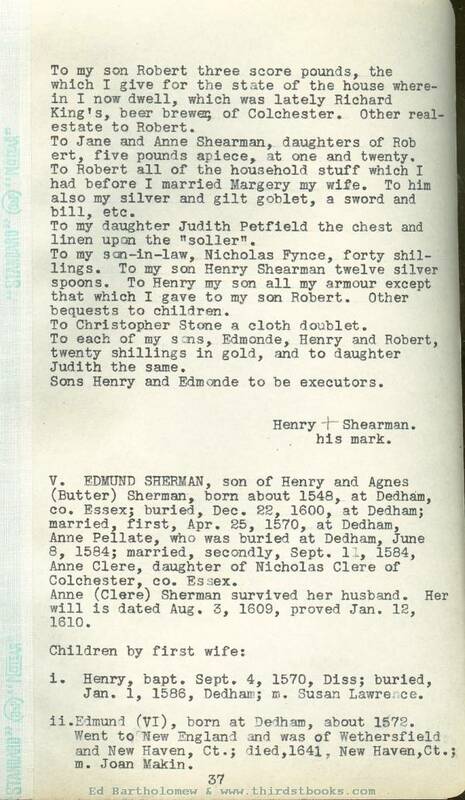 V. EDMUND SHERMAN, son of Henry and Agnes (Butter) Sherman, born about 1548, at Dedham, co. Essex; buried. Dec. 22, 1600, at Dedham; married, first, Apr. 25, 1570, at Dedham, Anne Pellate, who was buried at Dedham, June 8, 1584; married, secondly, Sept. 11, 1584, Anne Clere, daughter of Nicholas Clere of Colchester, co. Essex. Anne (Clere) Sherman survived her husband. Her will is dated Aug. 3, 1609, proved Jan. I2, 1610.
i. Henry, bapt. 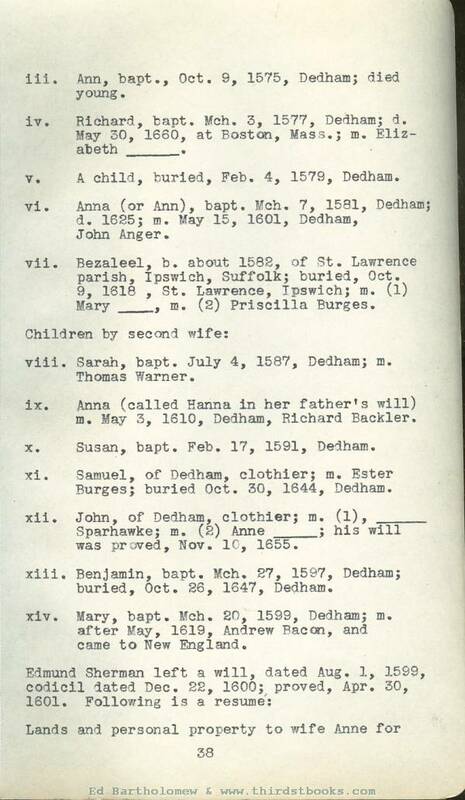 Sept. 4, 1570, Diss; buried, Jan. 1, 1586, Dedham; K. Susan Lawrence. ii. Edmund (VI), born at Dedham, about 1572. Went to New England and was of Wethersfield and New Haven, Ct.; died,1641, New Haven,Ct. ; m. Joan Makin. iii. Ann, bapt., Oct. 9, 1575, Dedham; died young. v. A child, burled, Feb. 4, 1579, Dedham. vi. Anna (or Ann), bapt. Mch. 7, 1581, Dedham; d. 1625; m. May 15, 1601, Dedham, John Anger. vii. Bezaleel, b. about 1582, of St. Lawrence parish, Ipswich, Suffolk; burled, Oct. 9, 1618 , St. Lawrence, Ipswich; m. (1) Mary ___, a. (S) Priscilla Burges. viii. Sarah, bapt. July 4, 1587, Dedham; m. Thomas Warner. ix. Anna (called Hanna in her father’s will) m. May 3, 1610, Dedham, Richard Backler. x. Susan, bapt. Feb. 17, 1591, Dedham. xi. Samuel, of Dedham, clothier; m. Ester Burges; buried Oct. 30, 1644, Dedham. xii. John, of Dedham, clothier; m. (1), Sparhawke; m. (2) Anne ____; his will was proved, Nov. 10, 1655.
xiii. Benjamin, bapt. Mch. 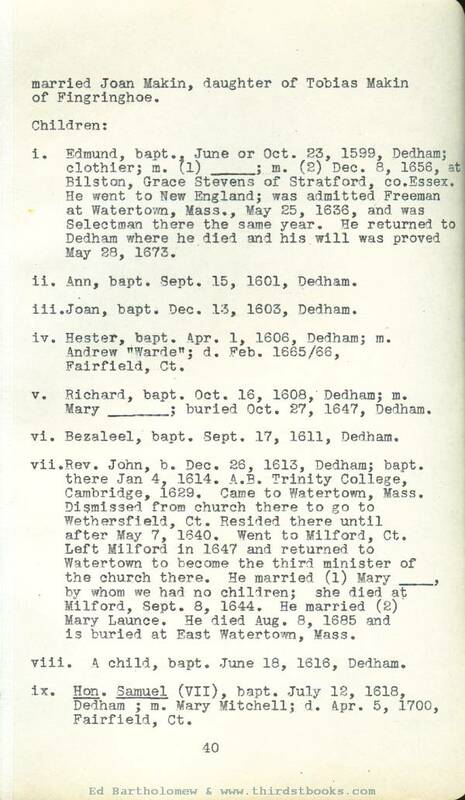 27, 1597, Dedham; buried, Oct. 26, 1647, Dedham. xiv, Mary, bapt. Mch. 2O, 1599, Dedham; m. after May, 1619, Andrew Bacon, and came to New England. To "Hanna say daughter which I had by Anne my second wife" at one and twenty. Same to daughters Susan and Mary at similar ages. To sister Judith Pettfield for life "the tenement wherein Edmonde Browne the taylor now dwelleth“. Lands, including "my house at the church gate" to be sold by my brother Henry Sherman and my kinsman (brother-in-law) Symon Fenne, clothier, of Dedham. "My youngest daughter Mary" under twenty. After wife‘s death gives to son Bezaliel tenement called Ryes, now in occupation of Edmond, on condition that he pay Richard fifty pounds. "After my sister’s death, I give the field and tenement before given unto her during life, unto the Governors of the Public Grammar School in Dedham, to be improved for a dwelling house for a schoolmaster." "To Sarah, Hanna the daughter of my second wife, Susan, Samuel and John, my children, twenty shillings apiece which was bestowed upon them by their grandmother Cleere." 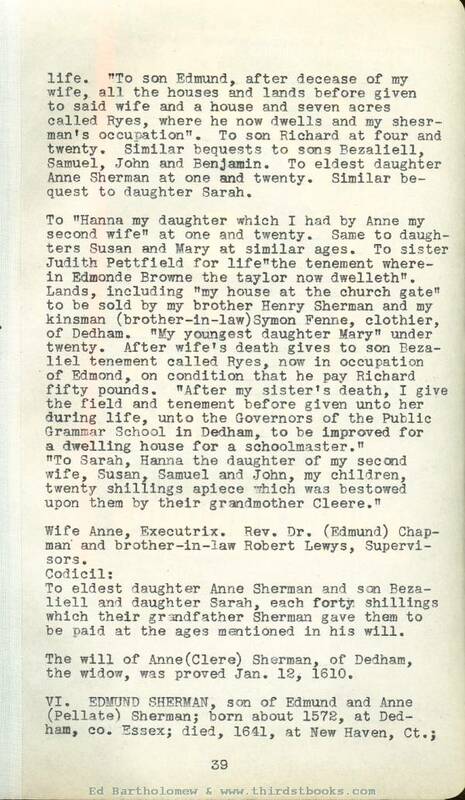 To eldest daughter Anne Sherman and son Bezaliell and daughter Sarah, each forty shillings which their grandfather Sherman gave them to be paid at the ages mentioned in his will. The will of Anne (Clere) Sherman, of Dedham, the widow, was proved Jan. 12, 1610.
married Joan Makin, daughter of Tobias Makin of Fingringhoe. i. Edmund, bapt., June or Oct. 23, 1599, Dedham clothier; a. (1) ____; m. (2) Dec. 8, 1656, at Bilston, Grace Stevens of Stratford, co. Essex. He went to New England; was admitted Freeman at Watertown, Mass., May 25, 1636, and was Selectman there the same year. He returned to Dedham where he died and his will was proved May 28, 1673.
ii. Ann, bapt. Sept. 15, 1601, Dedham. iii.Joan, bapt. Dec. 13, 1603, Dedham. iv. Hester, bapt. Apr. 1, 1606, Dedham; m. Andrew "Warde"; d, Feb. 1665/66, Fairfield, Ct.
v. Richard, bapt. Oct. 16, 1608, Dedham; m. Mary _____; buried Oct. 27, 1647, Dedham. vi. Bezaleel, bapt. Sept. 17, 1611, Dedham. vii. Rev. John, b. Dec. 26, 1613, Dedham; bapt. there Jan 4, 1614. A.B. Trinity College, Cambridge, 1629. Came to Watertown, Mass. Dismissed from church there to go to Wethersfleld, Ct. Resided there until after May 7, 1640. Went to Milford, Ct. Left Milford in 1647 and returned to Watertown to become the third minister of the church there. He married (1) Mary ___, by whom we had no children; she died at Milford, Sept. 8, 1644. He married (2) Mary Launce. He died Aug. 8, 1685 and is buried at East Watertown, Mass. viii. A child, bapt. June 18, 1616, Dedham. ix. Hon. Samuel (VII), bapt. July 12, 1618, Dedham ; m. Mary Mitchell; d. Apr. 5, 1700, Fairfield, Ct.